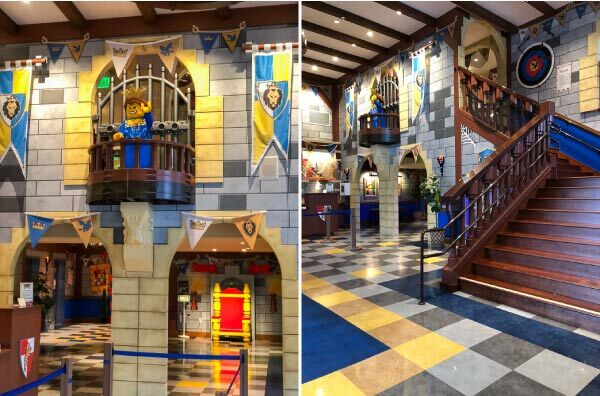 Inside: Taking your family to stay at the new Legoland castle hotel? 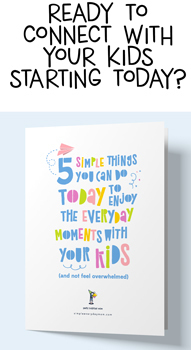 Find out all you need to know here, plus some useful tips and tricks. 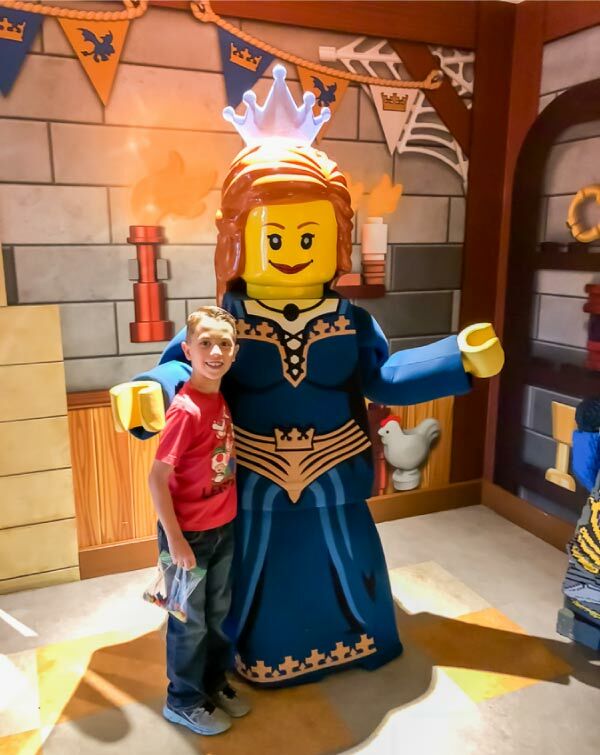 Recently my family and I got back from spending a few days at the new Legoland castle hotel and let me tell you, it was amazing! 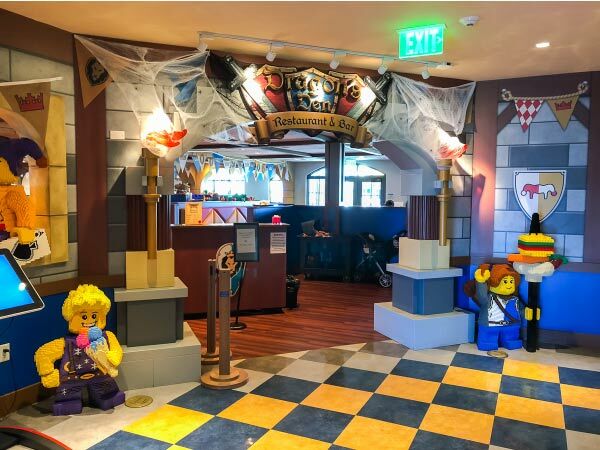 A few years ago we stayed at the original Legoland California hotel and loved it as well, but this new hotel is just bursting at the seams with all things Lego. 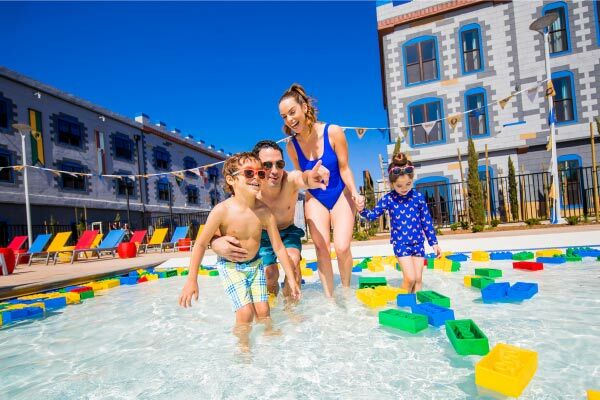 If your family is visiting the hotel and you want to make sure you soak up every ounce of it, read on below to find all the useful information you need to make this your best family vacation ever! And if you’re wondering if the cost of the hotel is worth it, check out all the awesome benefits of staying at the Castle hotel. 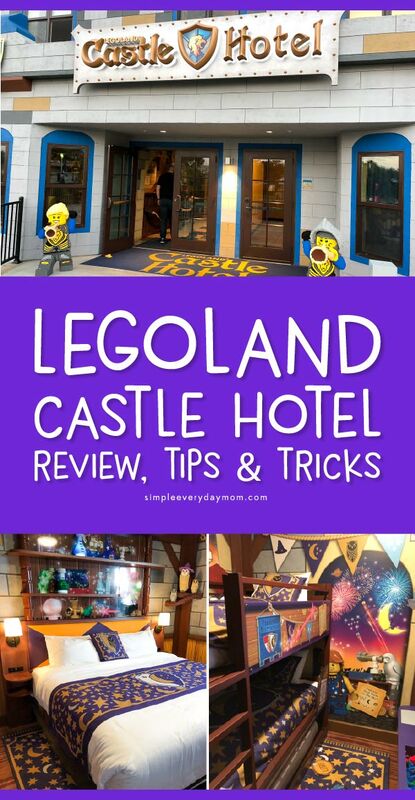 The Legoland Castle hotel is awesome. 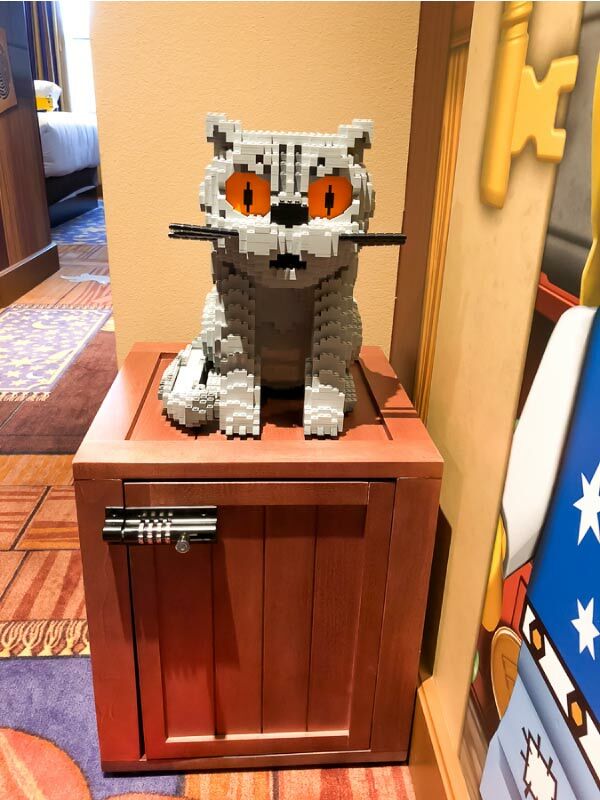 Practically every inch of the hotel is bursting with Legos and the entire hotel has your child’s experience as the number one priority. 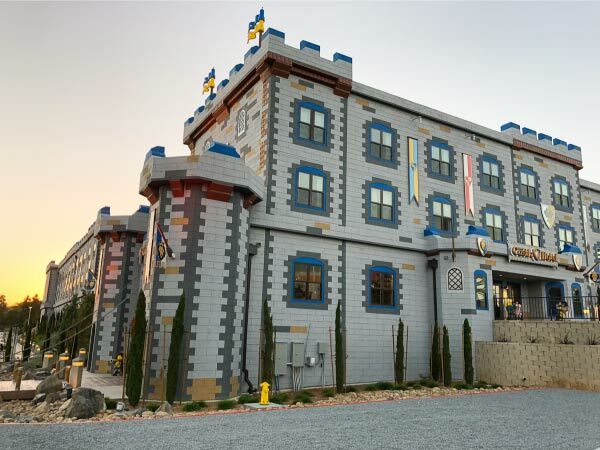 Beginning at the outside of the hotel, you’ll see that the entire outside of the hotel looks like a real Lego castle. 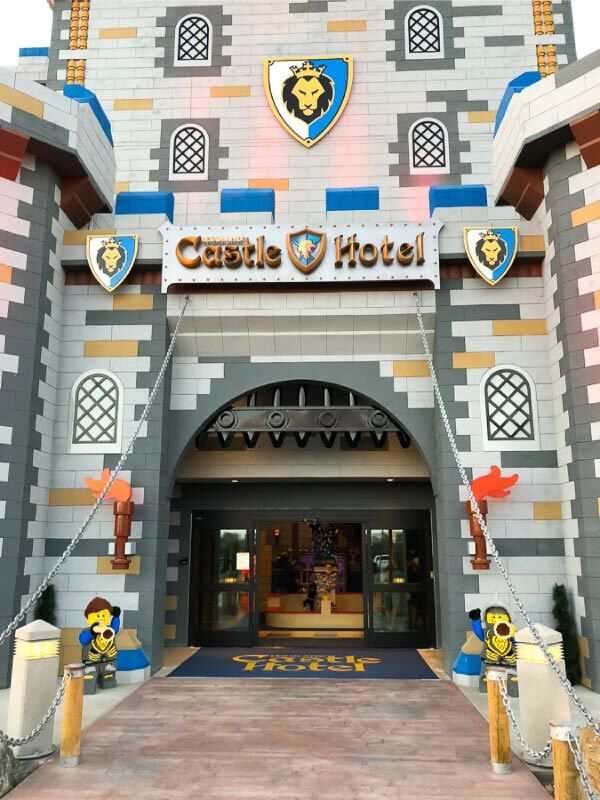 By the front entrance, there’s a drawbridge, complete with realistic looking wood panels, chains attaching to the hotel, life-size Lego knight mini figures at the entrance and Lego style torches. Off to the right side, there’s a giant Lego monument that has a rearing horse with his king and queen on top. On the ground, they’re also surrounded by a magician, knight, jester, and maiden. Left: The king on his horse model. Right: The gardener trimming some bushes. Outside the other entrance of the hotel, closer to the Legoland park entrance, there are more giant minifigs for your kids to take pictures with. When you walk in you really begin to see the scope of the hotel. In the lobby, kids are greeted with a giant pit filled with Lego bricks. 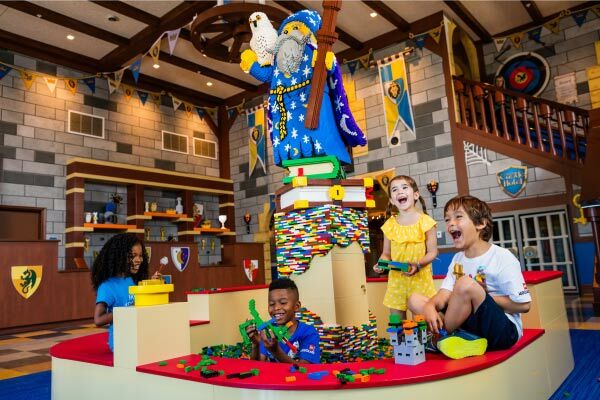 Kids can hop in, play and build until their parents are done with check-in. In the middle of the pit, there’s a stand that has another life-size wizard minifig and his owl friend sitting on his shoulders. Fun Fact: There’s a yellow button at the front of the pit kids can press to hear from Merlin the wizard. 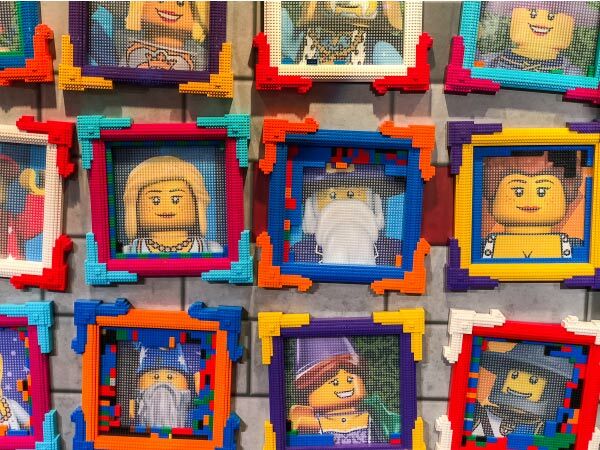 When you look around the entire lobby, you’ll see awesome wallpaper featuring Lego kings, knights, a dragon and more! There are hanging insignia banners, flags and torches on the wall as well. Left: The Princess greeting everyone hello. Right: The main staircase to the 1st floor. If you look up at the second floor, you’ll also see the life-size Lego princess waving down to all the guests. Just to the right of the short staircase to the second floor, you’ll notice a slide down into the lobby. It’s practically impossible to get your child to pass it without letting them go down it, because what other hotel in the world has a slide in the lobby?! When you walk slightly behind the lobby Lego pit, you’ll find the mini jail cell under the stairs. It’s locked in the front, but if you go around the corner, you can hop in the cell and take pictures. Down the little hall from the jail, there’s a giant-sized Lego throne where kids can sit and take pictures. Left: The outside view of the elevators. Right: The back wall of the elevator that lights up and talks. Next to the lobby elevators, there’s the jester’s knock knock wall. You use the door hanger to knock and the jester will tell you very cheesy jokes that kids just love. Secret Tip: If you’re trading minifigs (which you totally should; kids love it! ), don’t forget to stop by the front desk and ask to trade with them! They have a huge brick with tons of different characters to trade with. The life-sized minifig located on the 3rd floor. The entire hotel has been carefully planned out to delight guests. Even things like the trash can and elevator doors are Lego themed. The elevator also has a special surprise! When the doors close, the back wall of the elevator lights up and Merlin speaks to you. 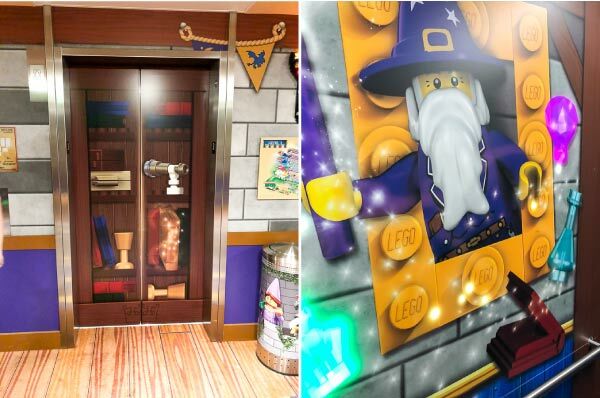 On each floor, when you exit the elevators there’s also a life-sized Lego minifigure to greet you. Of course, you have to take pictures with it. The women’s bathroom located just outside the hotel restaurant. 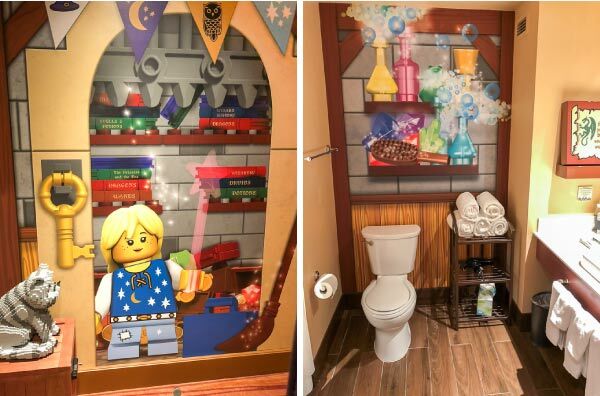 Even the bathrooms we stopped in were decked out in all things Lego and had more giant Lego models to check out. This restaurant is a pretty cool feature of the hotel. It is open to the public, so you can go whether you’re staying at the hotel or not. Right as you walk into the restaurant there is a kids’ play area. There’s a large Lego brick pit where kids can play and build. 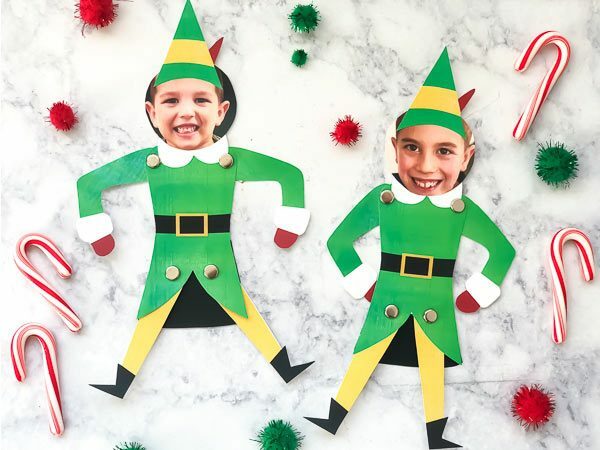 There are also 2 crazy mirrors, a wall of framed Lego characters that you can build on, a decorative Lego shelf and a spinner that tells kids different things to do while they wait (like tell a funny story or build a certain thing). Like everything else in the castle hotel, the restaurant is loaded with Lego models so be sure to walk around the whole place to take it all in. On top of that, all the servers and wait staff were extremely friendly and polite. We went to dinner here one night and the kids loved it. 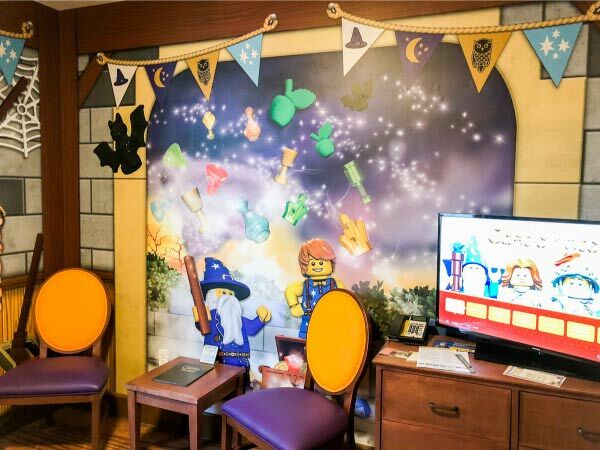 When you stay at the Legoland castle hotel, you’re able to pick from 3 different themed rooms including magic wizards (this is what we stayed in), knights and dragons, and royal princess. In each of the suite rooms, there’s a fun little separate nook for the kids. Inside, there’s a bunk bed (plus a trundle bed on the bottom), tv for the kids and a mini Lego play area with plates and Lego bricks. My kids had so much fun in their “rooms” that they stayed in there almost the whole time we were in our hotel room! Insider Tip: The room’s wallpaper features little games and puzzles for kids to solve, so be sure to check them all out too. Each room also has little details for kids like the peephole at a child’s level and a built-in child’s toilet seat (very useful for newly potty trained kids!). 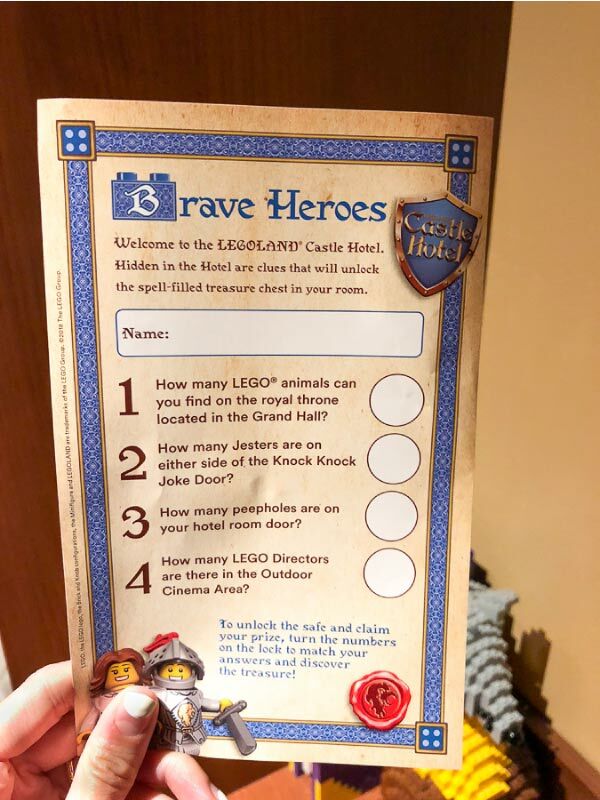 If you haven’t heard of the Legoland Hotel’s treasure hunt, it’s probably the number one thing kids enjoy about staying at the hotel! 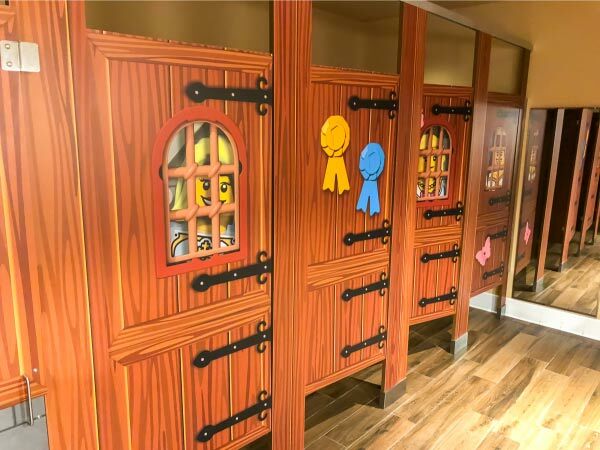 Each room has a chest with a rotating combination lock filled with a surprise Lego treasure. 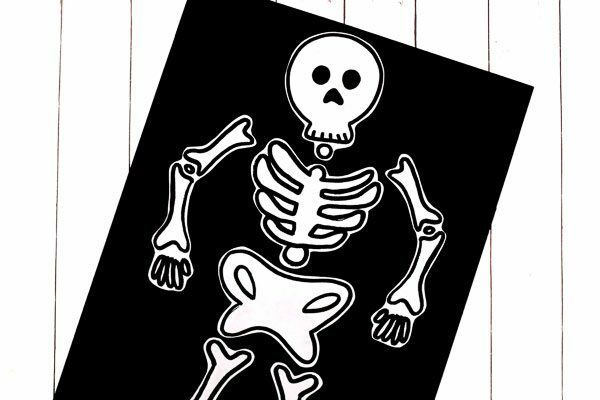 There’s also a scavenger hunt flyer that gives kids clues as to how to find out the code to their chest. 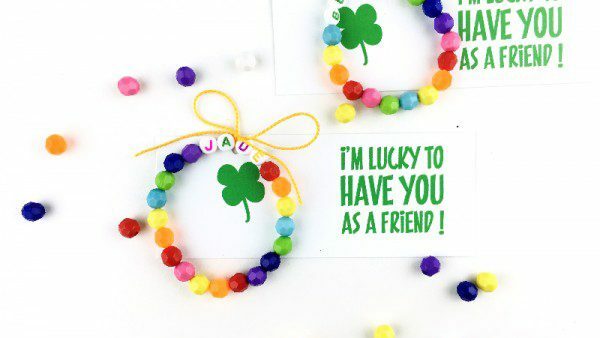 The scavenger hunt is easy, but I’m certain no kids will want to wait, so know you’ll be doing this activity as soon as you get to the room. 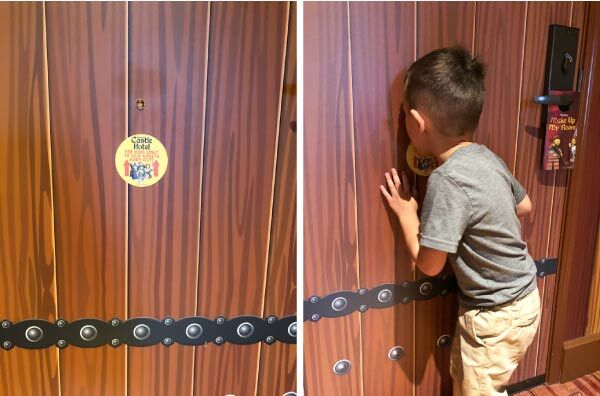 After the kids have filled out the scavenger hunt flyer, they can go back to the room, enter in the code and unlock the treasure chest for their cool treasure. Left: The 1st day’s treasure. Right: The 2nd day’s treasure. Each day that you stay overnight, the chest if refilled with new goodies (although the code stays the same). 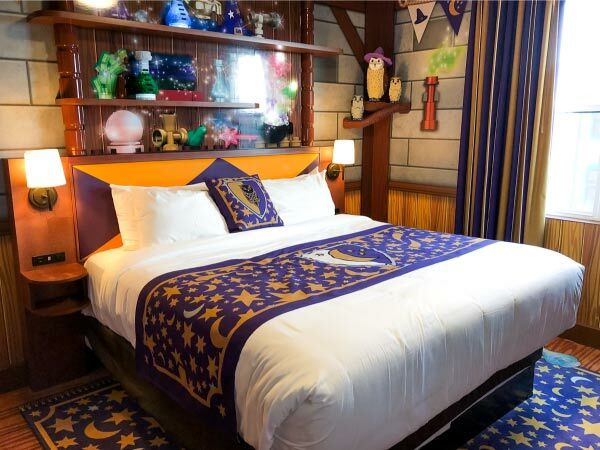 The king bed in the wizard themed room. 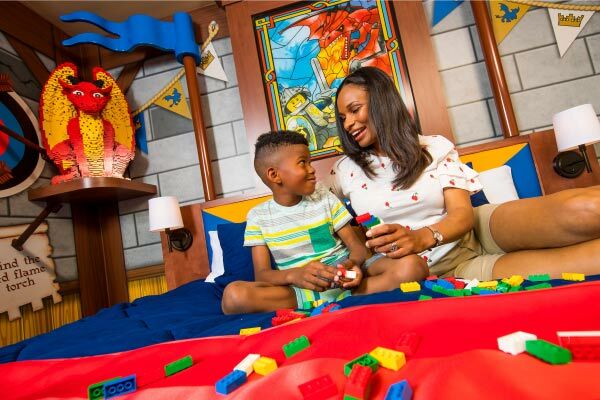 Every room is outfitted with an explosion of Lego themed decor! There are several giant Lego statues in the rooms, each relating to the theme of the room you chose. In our wizard room, we had a cat on top of our treasure chest, potions on our room wall, owls in the corner of the room, a mouse lounging on books, and another object (I don’t know what it’s called) in the bathroom. 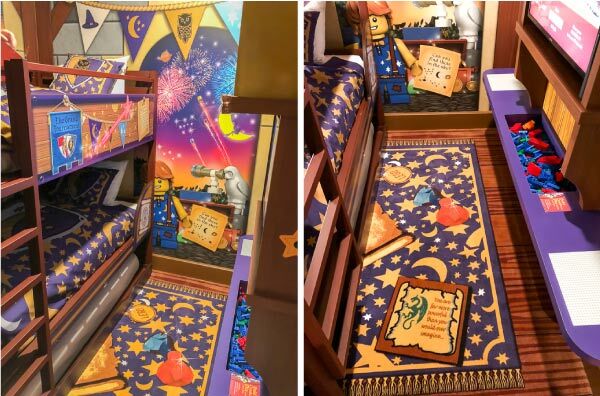 There’s Lego themed wallpaper on all the walls depicting different scenes and even the carpeting is Lego themed! Behind the king sized bed in our room, there was also a wall that lit up and sparkled. You can’t tell in the pictures, but even the tv had a Lego screensaver that said “Welcome Thomason Family”. The people at Lego have really done a spectacular job at putting Lego into all the details of the hotel. Each room has 2 flat screen TVs, wi-fi, a mini-fridge, coffee maker and a set of complimentary beverages for the family. On the tv you can also login to your apps like Hulu so you can continue to watch your favorite shows on vacation. If you’re on the fence about whether the price of the hotel is worth it, check out all the cool benefits you get when you stay there. 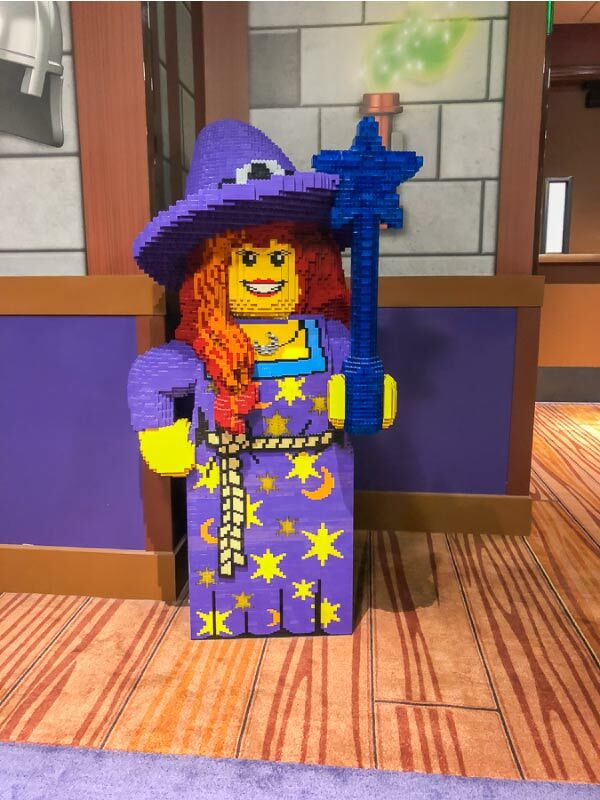 One of the best perks of staying at the Legoland hotel is the ability to get into the park 30 to 60 minutes early (the time depends on the season). You’ll need your park tickets and your room card so the employees know your family is a hotel guest. One thing to know is that the entire park is not open at the early time. My family and I were excited to ride the new submarine ride, so we headed to the back of the park when we were let in, but that ride wasn’t one that opened early. Be sure to check here for the rides and attractions that you can access at the early time. Oh, and yes, it really is just steps to the entrance of the park. Every night from 6-10 pm there is a variety of entertainment options available for the family to enjoy. These activities change frequently so your family will get a list of what’s available when you check in. When we were visiting, they had things like movie nights, dance parties, plays, games and more! 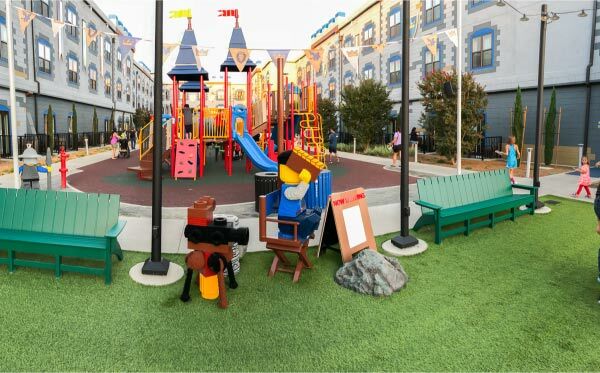 There is also an amazing courtyard for hotel guests to play at that includes a large playground, a movie area, a Duplo space for young kids and a stage. Only the hotel guests are able to play there and it’s seriously fun! 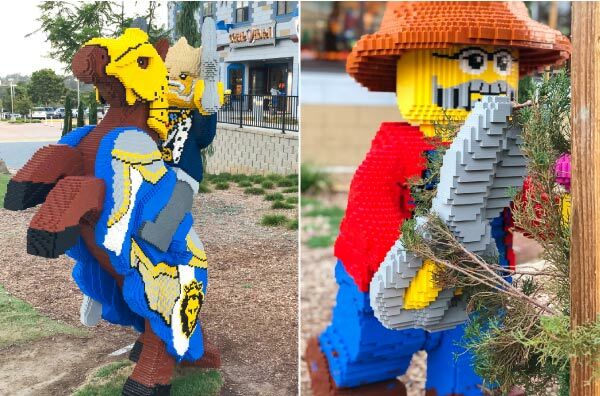 Some of the giant minifigs in the play courtyard. My boys wanted to play there all the time. 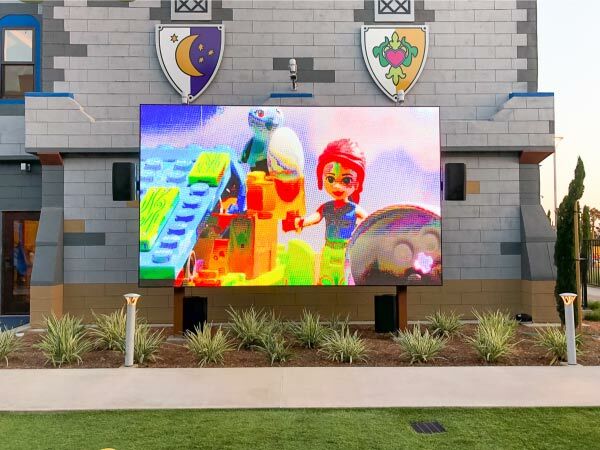 And in typically Lego style, there are giant Lego characters peppered throughout the courtyard for kids to check out and admire. Although we didn’t go to the pool during our stay, I saw it from our room and the courtyard and it looks excellent! The pool is zero entry, heated (to 80 degrees), has water features in the pool, fun Lego brick toys to play with, and a stationed lifeguard. The pool hours are generally from 8 am – 9 pm but they’re subject to weather. If you plan to spend a lot of time poolside, you can rent one of the private cabanas. Each cabana rental includes a table, lounge chair, and daybed. 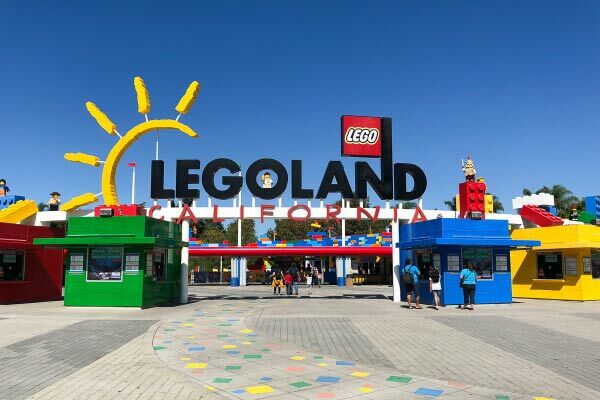 You’ll also receive 2 complimentary Legoland towels, a tote bag, and a food and drink credit. When you book your room, you’ll be able to choose early check-in, late check-out or both (at an additional cost). This is a great feature when you’re trying to plan around flight times or if you just want to sleep in a little more on check-out day. The Castle hotel doesn’t offer cribs to their guests, but they do have pack n plays available, so you don’t have to lug your own around! The pack ‘n plays are offered at a first come, first serve basis, so if you’re worried about it be sure to request one at the time of your booking. Another cool feature the hotel offers is a luggage storage space before check-in and after check-out. With this feature, you can enjoy the park the rest of the day and not worry about leaving your luggage in the car. When you stay at the hotel, you also get free premium breakfast in the new Dragon’s Den restaurant. This includes everything from eggs to pancakes, waffles, muffins, cereal, omelets, bacon, sausage, fruit smoothies and more! Pretty much everyone can find something they like to eat. Insider Tip: You can call ahead and ask about food for kids with allergies. Our younger son can’t have dairy and loves cereal, so we needed a dairy-free alternative (they gave us soy milk instead). At check-in, you’re able to select breakfast from 7-8 am or 8-9 am. We chose 8-9 am and boy was it packed! When we were there the park opened for early access at 9:30 so I think that’s why it was a popular time. We had to wait for a good 20-30 minutes before we were seated. If you’re worried about the wait, however, just relax! The good people at Lego know how to entertain kids. Right after you walk into the restaurant on your left is a kids’ play area. There’s another large Lego brick pit where kids can play and build. 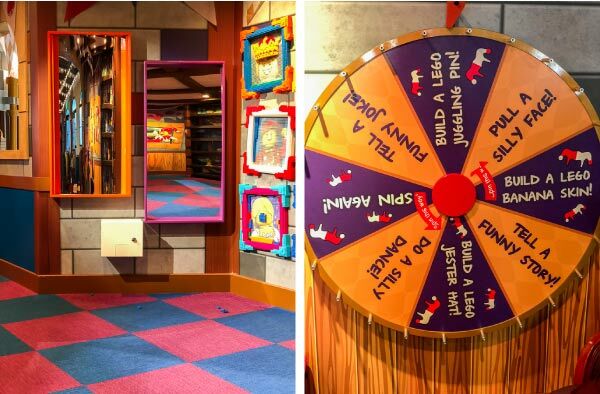 There are also 2 crazy mirrors, a wall of framed Lego characters that you can build on, a decorative Lego shelf and a spinner that tells kids different things to do while they wait (like tell a funny story or build a certain thing). If it’s too busy in the waiting area, kids can also go right outside to the courtyard and play on the playgrounds while a parent waits in line. We didn’t use any of these services (besides the housekeeping), so I can’t speak personally to them, but judging by all the other interactions we had at the hotel, I’d say they’re top notch. When you book your room, you will also have the option of purchasing a birthday package for your child. 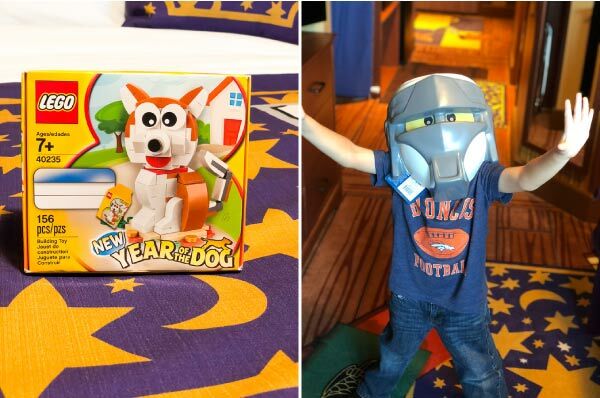 This package includes a Lego themed cake, Lego gifts and a free dinner for the birthday child at the Dragon’s Den restaurant. 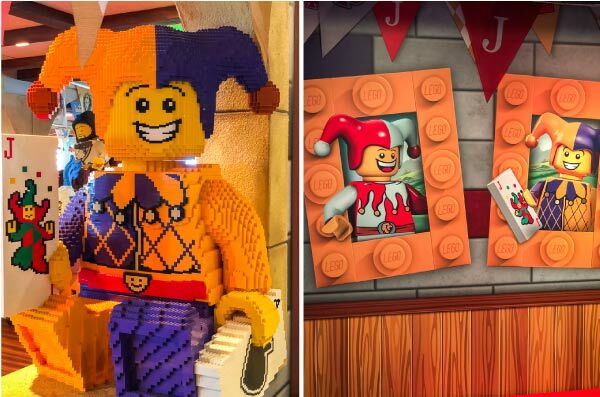 You can also choose to purchase an unlimited digital photo pass for your time in the Legoland park. This gets you free digital downloads of your pictures from park rides and character meet and greets. There were also random meet and greets in the hotel with the princess and knights. 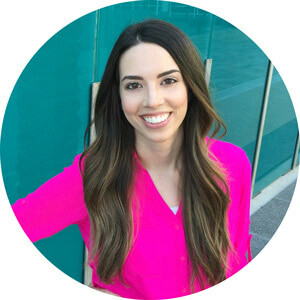 If you’re looking for a way to save some money on the hotel costs, there are a few options you may be able to consider. 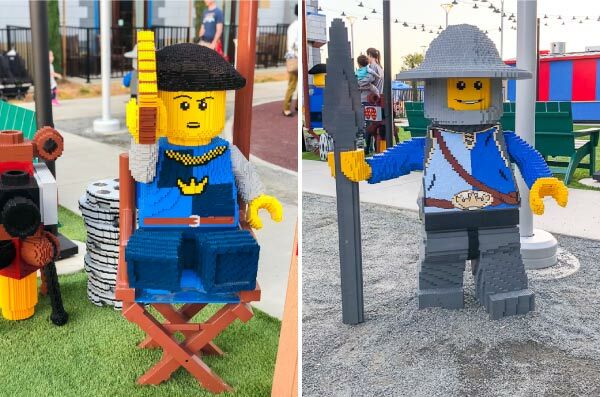 First, if you or your spouse are in the military, Legoland does offer a discount rate. You will need to have a valid military or government issued ID with you at check-in, so don’t forget it at home. Also be sure to check with the hotel first, because there are some blackout dates where you can’t use the discount. There are other restrictions that may apply too. Click here to see all the restrictions and terms. Another way to save a few dollars at the hotel is to use your AAA discount. 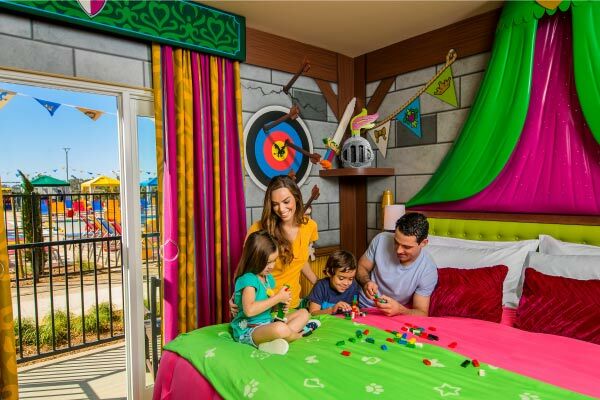 Currently, the Legoland hotels suggest AAA members purchase directly from the local branch to get the best prices. Remember, you’ll also need your valid AAA membership card with you at check-in. The percentage discount varies (up to 10%) with the seasons, so plan ahead accordingly. Click here to see the full restrictions and information. Families that hold annual passes can get 15% off hotel prices (at the time of writing this article). Like other discount offers, there are some restrictions. See the restrictions here. If you decide to stay at the Castle hotel, when you book online you’ll be presented with a few different options for additional amenities and products to buy ahead of time. If you buy at the time of booking, you’ll save some money when you compare it to buying them while you are staying at the hotel. One discount is valet services. When you choose valet parking at booking, you’ll save 20%. Another option available is the purchase of a Coca-Cola freestyle souvenir cup. The freestyle souvenir cup is a 24 oz cup that has a chip embedded in the lid so you can refill it at select places in the Legoland park every 10 minutes. If you plan on drinking soda while you’re there, it’s a pretty good deal. When you book online, you can get 2 days of drinks for the price of one. 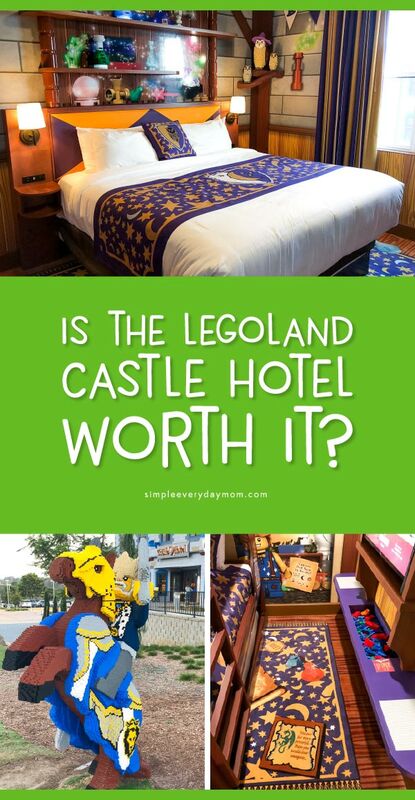 Really, I think every family will have an amazing time at the Legoland Castle Hotel. 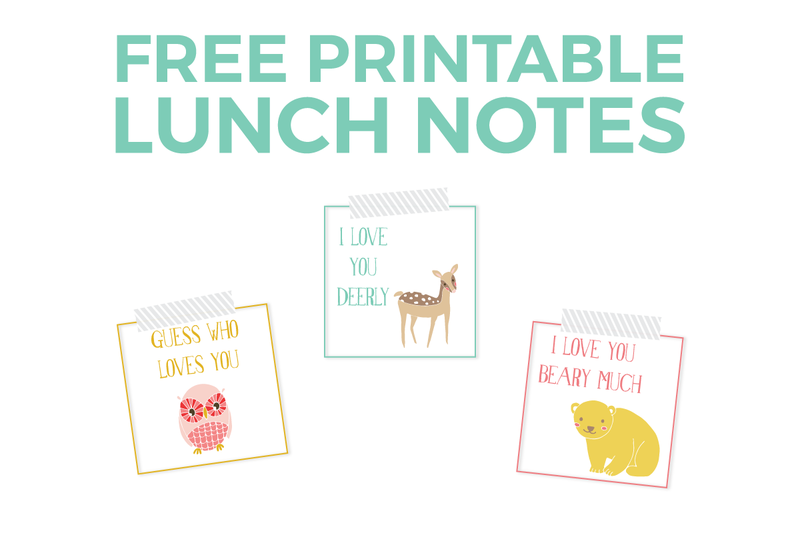 If there’s any way to squeeze it into your budget, I’d highly suggest it!